Queen Victoria graciously agreed to make one of her rare public appearances to open the bridge, and it had been hoped the ceremony could take place on 24 May 1869, the Queen's fiftieth birthday, but the bridge was not ready in time. The official opening took place on 6 November, when the Queen also opened the new Holborn Viaduct. Although it was claimed it would be a fairly simple ceremony, pavilions capable of seating four thousand notable persons were erected on both sides of the bridge. Vast crowds were expected to line the royal route to get a rare glimpse of the Queen, and the temporary bridge was closed to vehicles and pedestrians for the day in case it collapsed under the weight of sightseers. The Queen arrived at Paddington by train from Windsor and then drove in procession over Westminster Bridge and along the south side of the river to the bridge, where she was met by the Lord Mayor. After the formalities, she passed slowly over the bridge and up to Holborn Viaduct for the second opening of the day. 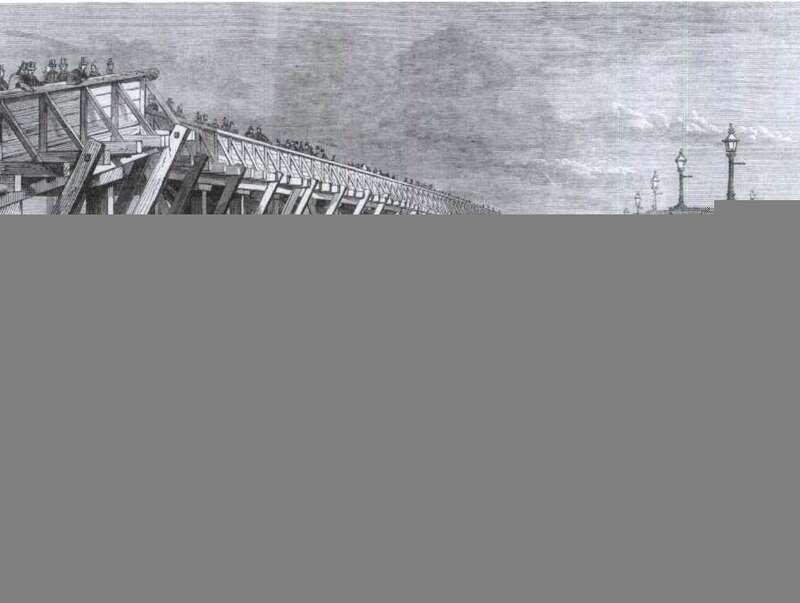 An engraving from the Illustrated London News showing the two-tier temporary bridge, built alongside Blackfriars Bridge before its replacement. Cubitt's five-span iron bridge was very different in style from the first bridge, with decoration in what was called Venetian Gothic style. At 75 feet wide, it was twice as wide as the old bridge, and it also had a much shallower gradient. The central span was 185 feet wide, the two adjacent spans 175 feet and the two shore spans 155 feet. Each arch consisted of wrought-iron ribs, the visible outer ones having open lattice spandrels. Great care was taken over the details, such as the attractive cast-iron balustrade, whose columns had a variety of decorative capitals with little trefoil arches between them. On the end of each pier is a monumental column of polished red granite, 7 feet in diameter and nearly 12 feet high. Each column is made up of three blocks of granite from the island of Mull and was polished by the Scottish Granite Company at their works near Glasgow. The columns are capped with intricately carved capitals of Portland stone, sculpted by John Birnie Philip, and each one is different. The four facing upstream include plants and birds from the upper parts of the Thames, while the four on the downstream side show birds and seaweeds from the estuary. Resting on top of the columns are pulpit-like refuges for pedestrians, complete with hard stone seats, a reminder, it is sometimes claimed, of the work of the old monastery. When the bridge first opened, the ironwork was painted a bronze green colour, with some of the detailing in gold. In 1934 the bridge was repainted in two shades of brown, but today it is a rather more cheerful red and white.